Remember my tendency to giggle when I have a super fabulous dessert recipe that I can’t wait to share with you? Well, this baby had me giggling all day long yesterday. We had a couple over last night for dinner and I had to come up with a new dessert recipe. In fact, all of the recipes I made last night were new creations since one of the duo coming over was a food blogger as well. I figured that if anyone would forgive a new recipe mistake, it would be him. My advice to you? Have a casual dinner party right after Halloween and make this. I used up SO MUCH candy making this and sent home leftovers with my guests. Winner winner dessert for dinner! 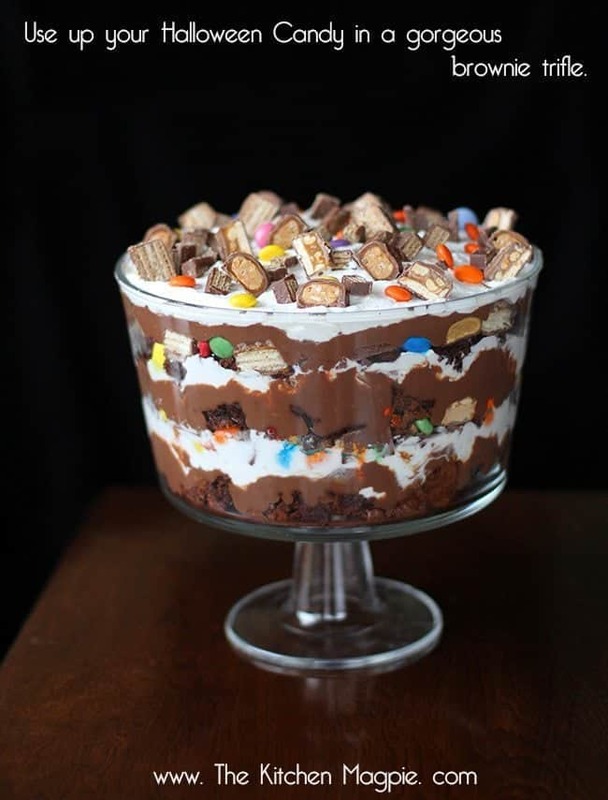 It’s hard to gauge how much candy you need, but I would aim for about 3 cups of chopped chocolate bars, M&M’s, basically anything that has chocolate will be good. Avoid the other taffy’s, gummies etc as they will not work out well in this. 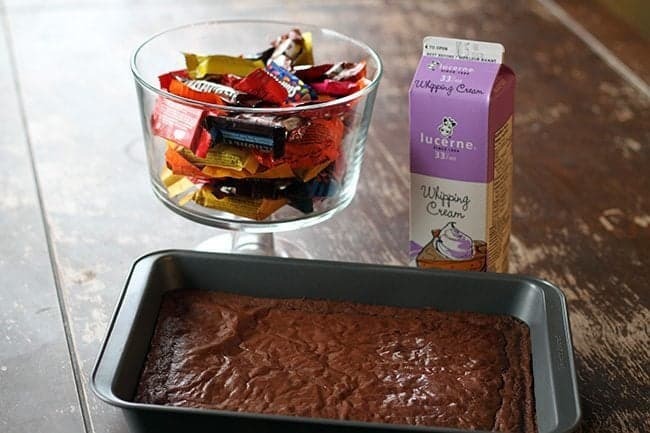 All you need is Halloween chocolates, a baked up 9×13 brownie, chocolate pudding and whipping cream. You can either use a box recipe to make things faster or my Best Brownies Ever recipe. 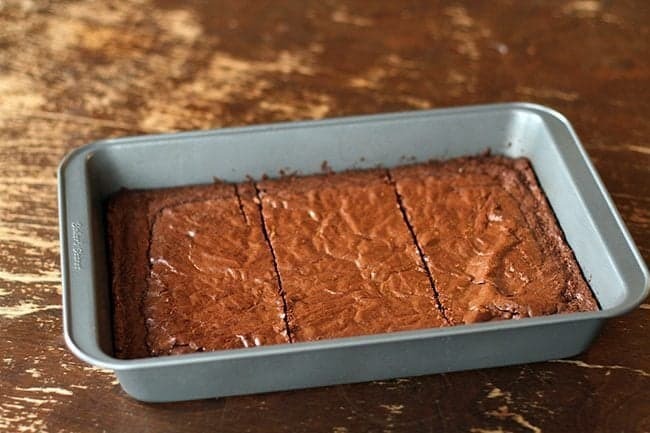 Make sure to cook it in a 9×13 pan, we are looking for thin, chewy brownies. Slice the brownies into three, one part for each layer. 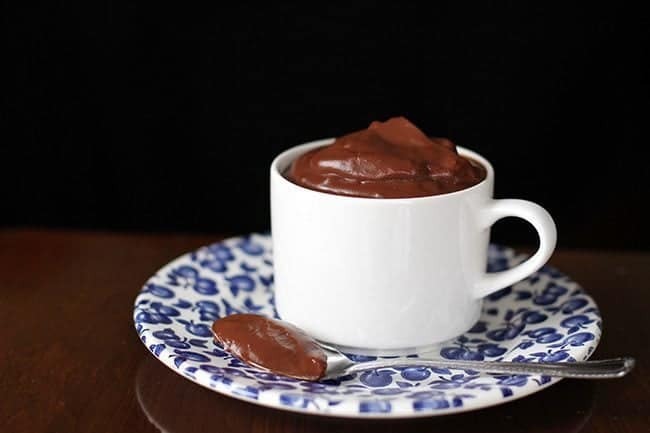 For the pudding, you can make my Homemade Skim Milk Chocolate Pudding recipe. It was amazing and not too sweet. If you want to save time again, use a boxed one. Also, my recipe makes enough to have one cup of pudding per layer and you won’t get that with a boxed mix. 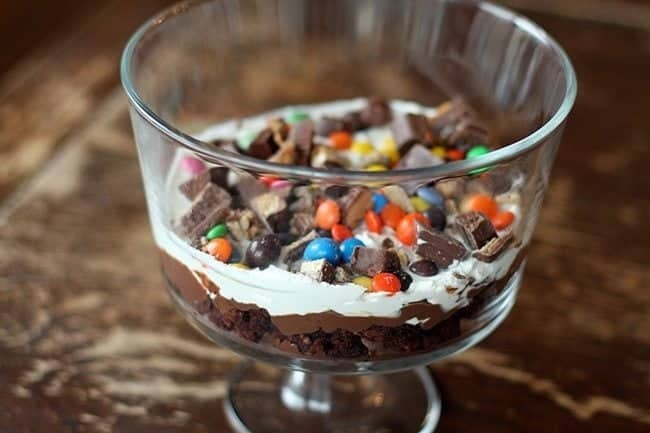 This pudding is the bomb. Seriously. Whip three cups of whipping cream with your mixer, adding in one tbsp of sugar to sweeten it just a little bit. 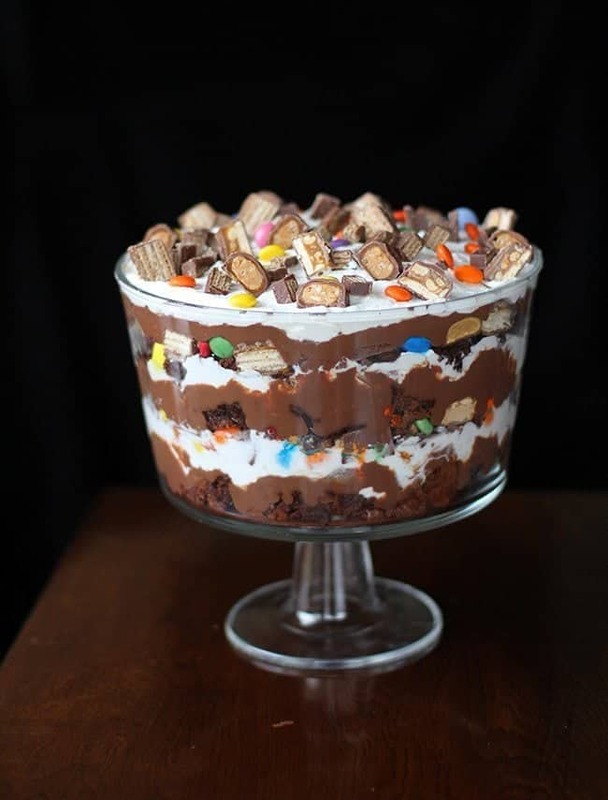 Start with a layer of brownies all chopped up, one cup of chocolate pudding, one cup of whipped cream then one cup of chopped up Halloween candy. 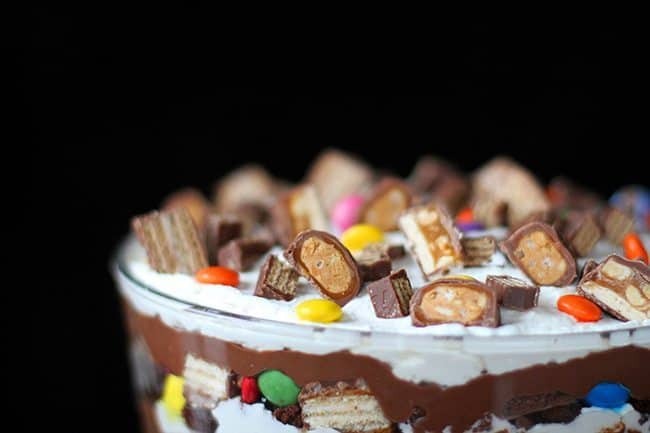 Repeat all these layers until you end with Halloween candy. You should have one cup of whipped cream left, so use that on the very top. 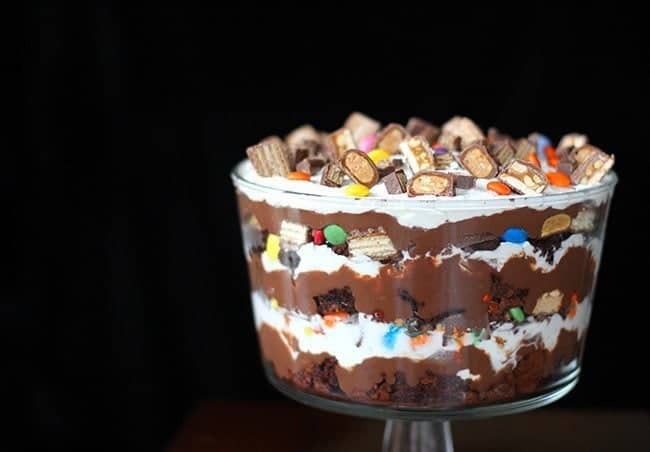 Then cut up as many more chocolate bars as you want to decorate the top. Make it, eat one serving then send it away. You’re going to have to. My mistake was making this for a dinner party of only four people (plus the kids had some as well). This is perfect for a large get together, as I would guess it would serve around 16 people and that’s giving them large servings! However, I had my Tupperware ready and sent home a good quarter of this with our guests. If you aren’t having any guests over soon, try to set a large amount of these aside and keep it for your next event. I know, it’s hard not to snack on those little devilish chocolate bars when they are in the house, they are like a siren song calling to you. I’m having a hard time getting over this deliciousness and moving on to creating another recipe. I just want to wallow in it’s awesomeness a little more. Speaking of which, which candy is your siren call? Which one can’t you resist? I am infamous for my love of Coffee Crisp, which is a chocolate bar that’s available here in Canada but not the States. What’s yours? Snickers? Milky Way? Licorice? I used cool whip and instant choc pudding.